With Scott Eastwood, Rita Wilson and Jeff Fahey on the cast list, I had high expectations for Daniel Petrie Jr.’s latest melodrama DAWN PATROL. Unfortunately, I was left disappointed. DAWN PATROL tells the story of a surfer-turned-Marine who sets out to avenge his brother’s murder. 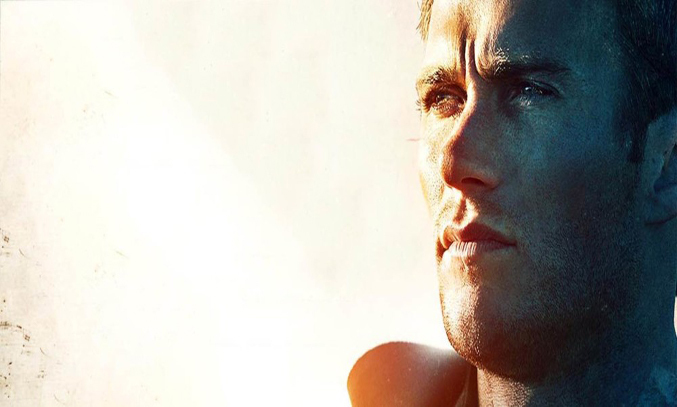 The film opens with John (Scott Eastwood) held at gunpoint in a distant desert. To stall his pending execution, John tells his tragic story of revenge gone wrong, as the film flashes back to the events which led him to this point. The flashback takes us back to Venice Beach in the summer of 2008 during the recession when people are losing their homes to bank foreclosures. The plot is set in motion when local boy Ben (Chris Brochu) spots his on/off girlfriend Donna (Kim Matula) canoodling with her new Mexican boyfriend Miguel (Gabriel De Santi) and a fight promptly breaks out. A few nights later, Ben is found dead on the beach and family assume the killer is a Mexican gang member, urging John to exact revenge. But a series of mistakes end up with John killing the wrong man, only to face his sins years later at gunpoint, where he must survive a captor bent on revenge. Written by Rachel Long and Brian Pittman and directed by Daniel Petrie Jr., DAWN PATROL is essentially a story about the consequences of revenge. Although the multi-themed plot purports to deal with serious themes such as guilt, liberation, xenophobia and sexism, its melodramatic screenplay and heavy-handed direction turn this promising and compelling story into a disappointing drama/thriller. The pace is maddeningly sluggish, the dialogue is poor and the plot becomes so messy that is it difficult to keep up with random jumble of events from the past, present and future. Where DAWN PATROL really falls down is with the characters. Aside from the lead, the vast majority of the characters are exaggerated and unlikable. John’s family (mother and father included) come across as a bunch of immature racists who seem to do little with their lives other than drink, surf and smoke pot. As a consequence, it’s incredibly hard to like them, let alone care about them and without any real emotion, there really isn’t much to hold onto. On the plus side, Scott Eastwood puts in a solid performance as John, displaying a low-key charisma that bodes well for future outings, while Rita Wilson and Jeff Fahey shine a John’s parents Shelia and Trick, providing much-needed drama and tension to the movie. There’s also a nice twist at the end which helps to make up for some of the flaws. Despite its initial promise, DAWN PATROL fails to deliver. A disappointing melodrama that downplays the talent of the cast. DAWN PATROL is released on DVD and VOD in the UK on October 5 2015.